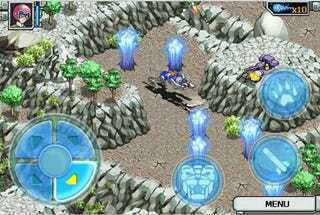 Sony's Voltron iPhone game looks interesting, because you get to pilot the separate lions in 2/3 isometric view, and in a head to head fighter mode, but ultimately disappointing. Why? Because you can't get four friends and make a Voltron. The screenshots also show the inherent problem of having a touchscreen be your screen and your control interface. It's much worse here, with the buttons taking up a good 1/4 or 1/3 of the real estate. But it is only $4, and if you're the kind of guy who enjoys games based on series that are more than 20 years old, boy has Sony Pictures got the app for you.